Shop & Play til 9pm – It’s First Friday May 2nd! 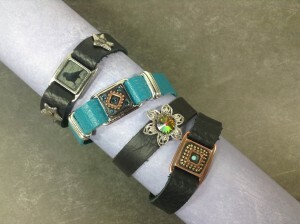 Watch fun demonstrations showing off the cool riveted leather bracelets we’ve been making! Shop til 9pm! Enjoy all the activities downtown…live music, free admission at the Racine Art Museum (RAM) and glass blowing demos at Hot Shop Glass from 6-8:30. Don’t miss the fun! Downtown Racine is the place to be & Funky Hannah’s is in the heart of it! We are open 10am til 9pm.